We all have our favourite shows… the ones we tune into every week or PVR and watch at our leisure. 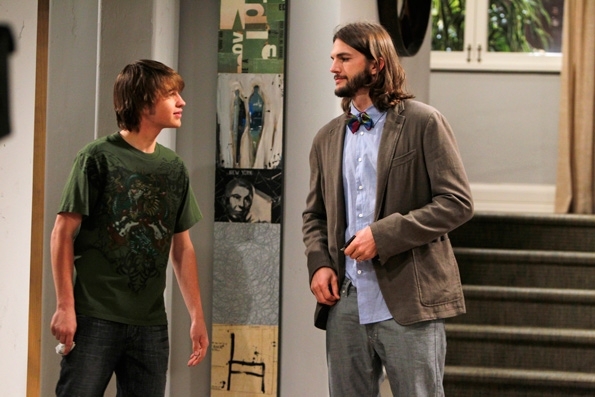 I have been getting into Two and a Half Men and I’m really loving the new season with Ashton Kutcher playing Walden. 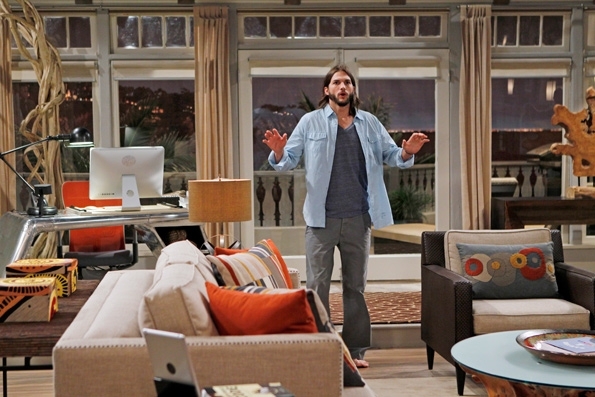 One thing that really caught my attention is when Walden hires a decorator and completely changes the look of the set! 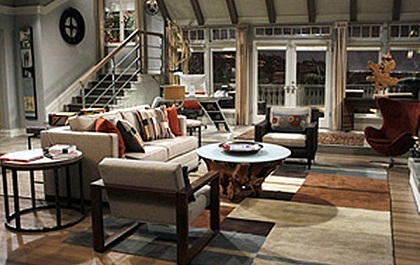 A new show with out Charlie Harper definitely needs a new look too. I personally love, love, love the new scheme they went for. Any good designer knows that if you are decorating a home it should have a lot of personality based on who lives there. When I see this new space I give kudos to the set designer, as they have truly captured Walden’s nerdy and tree hugging personality! I have some tips on achieving Walden’s new look. To his track pants to his tailored suits, Walden wears a lot of grey! The living room is in a warm grey and the kitchen has soft grey sub way tiles as the back-splash. The kitchen dining set was upgraded to a steel base table and matching steel and wooden chairs. Natural drift wood on metal stands make dramatic and organic pieces of art that make a statement! There is a picture/poster in the hallway (to the left of the refrigerator) that is a replica of a wall in Cincinnati that my husband took a photograph of. It is a woman’s face holding a newspaper, with a red background. We are interested to know where it came from? Sort of which came first, the artwork, or the wall on which it is painted in the Columbia Tusculum area of Cincinnati. I believe my husband has a print of it on his website; http://www.ohiosilver.com (Max Skeans). Any ideas as to how to find this out? Thanks! Not sure if you can help but I’d love to know more about the artwork in the entrance (to the left of the stairs – 3rd down in the ‘After Pictures’), i.e. who the artist is, etc. You may not be able to help with that but if you could let me know where you sourced the images maybe I can find a trail that leads to the info I want? It would be appreciated… thanks! You can email: michael@kelseymichaels.com if you have any questions about her work. My friend is the sister of the artist. http://www.kelseyhochstatter.com/. Enjoy her work. There is a chest in the new bedroom. I think, I located that item at Zin Home. It is called Angora 8 Drawer Chest. Where can I get the rug in the new kitchen? 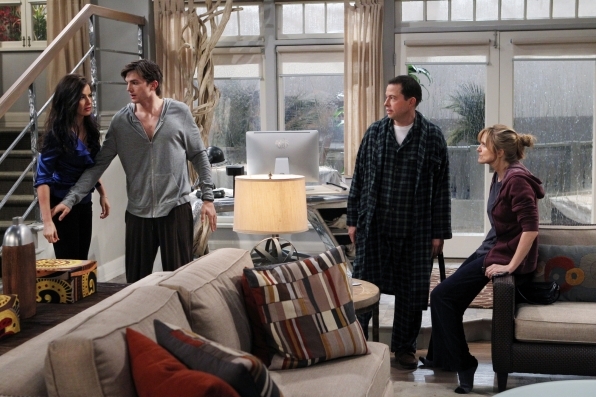 I am trying to find out who did the painting in Charlie’s bedroom, painting of the back of a red car. Saw it in the Season 6 episode of “My son has an enormous head”. Thanks!!! Where can I find the blinds on the windows and doors? Who is maker of Walden’s table in living room? this silver one? Any idea where to get the pillow on the chair, the grey one with circles on it? in the fourth picture down? Does anyone know where the wooden artwork in the bedroom came from (or have a picture of it?) ? It’s over to the right, above a dresser I believe. It is all wooden (boards) and has a number on it, I think it’s the number 3. I would like to know about the picture in Waldens bedroom that looks like a city street in the rain. Does anyone know where I can purchase the picture in Walden’s bedroom? It looks like a rain drop picture—it was in the most recent episode when Berta was in his room taking a nap/throwing out her back? Does anyone know who the artist is for the painting that is to the right of Walden’s bed in Season 11? It looks like a window with rain drops. Calendar- Book Design Consultation Today!